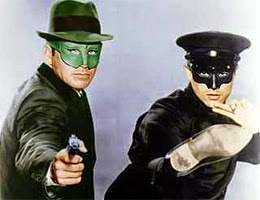 48 years ago on this date of Sep 16 in the year 1966, the second episode of the new TV series, The Green Hornet, aired. Posted this episode to mirror the airdate from 48 years ago. Enjoy Bruce Lee in action! Publisher Britt Reid employs his alter ego The Green Hornet to bail him out when a overzealous reporter, exposing a fake injury insurance scam, leaves Reid's newspaper vulnerable to a libel suit. A masked man in a black costume swoops down on a rope, strangling the reporter's source, and the reporter alleges the Green Hornet's behind the racket. Reid sweet-talks a luscious libel attorney, while The Hornet and sidekick Kato pretend to horn in on the racket. Al Hirt's blaring jazz trumpet backs the action.